Last week my team had our very first mobbing session together. I was quite excited! I have read and heard a lot about this whole-team approach, and I was curious to try it myself. I had a first glimpse of how it could look during a coding dojo I attended a few weeks ago, but I really wondered how it would be to try this with the people I work with every day. I guess I talked a lot about mobbing, presenting it as a potential solution for some of the problems we are facing. And suddenly, during a sprint retrospective, my team decided to give it a try! Here's the story how it turned out. Since I was the one who triggered this experiment, I was also accountable for having it facilitated. However, I also wanted to join the mob myself. 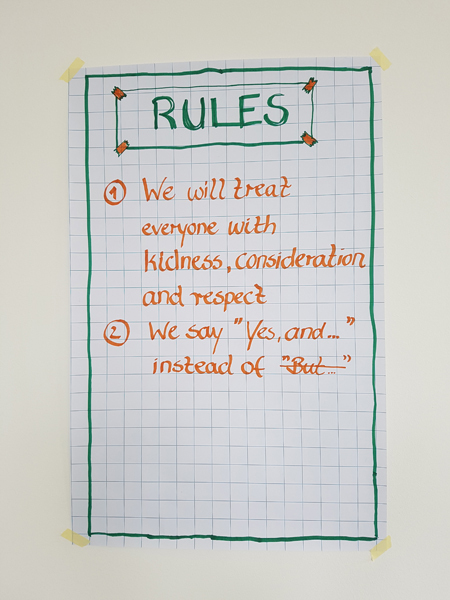 So I asked our agile coach if she was willing to help me and act as facilitator during the session. So glad she agreed! As nobody on our team ever tried mobbing before, I wanted to have our first session facilitated as well as possible to get everybody on board. To prepare for it, I used the following valuable resources on mob programming and mob testing. You can skip over them for now, but in case you would like to facilitate a session yourself, I highly recommend following those links. Book: "The Mob Programming Guidebook" by Maaret Pyhäjärvi and Llewellyn Falco. This was our major source of wisdom. You'll find invaluable advice here, especially for beginner facilitators to get started. Conference talk: At Agile Testings Days 2016 I attended the talk "Swarm – Beyond Pair, Beyond Scrum" by Danijel Arsenovski. You can find the teaser video as well as his slides online. "Microservices Manchester 2016: Mob Programming by Alison McGreavy"
"Mob Programming with Woody Zuill"
"Maaret Pyhäjärvi explains how the whole team can work together"
"We talk all things Mob Testing with Maaret Pyhäjärvi"
"Episode 36 – Maaret Pyhäjärvi on Testing Software"
All resources recommended starting with a short session, so I scheduled 2.5 hours for it. As we don't have a dedicated team room, I also booked a meeting room well in advance, as otherwise it's hard to get one for a longer time slot at my company. 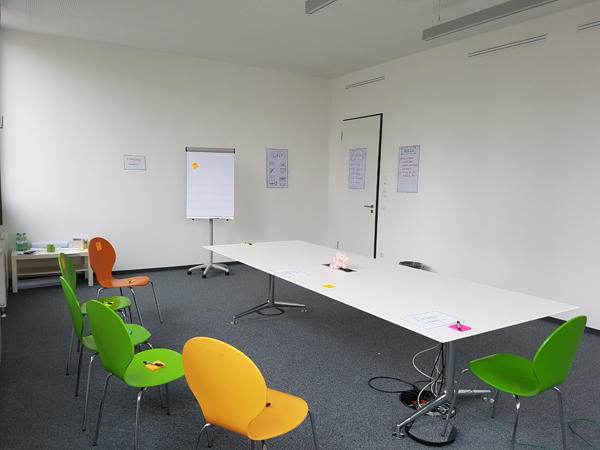 Our agile coach and I sat together to prepare the session. We shared any knowledge we already had about mobbing, defined the structure and prepared posters to serve as information radiators throughout the session. 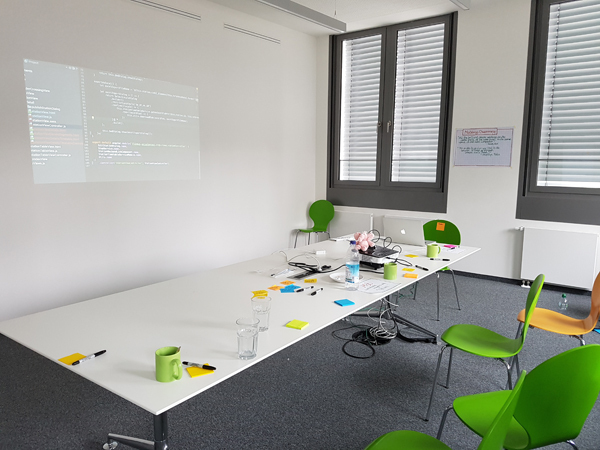 I asked my team whether they would rather do the experiment in coding dojo style using a dedicated kata, or if they wanted to work on a real story from our backlog. The team decided unanimously to go for the latter. During sprint planning just before our workshop, we picked a middle-sized, quite straightforward story and reserved it for our mobbing session. We knew how the meeting room we booked looked and what it offered. We identified a list of things we had to bring ourselves. What not to bring? Any other laptops or mobile phones, to avoid distraction. Though this might change later on, we decided to be strict about this for the first session to have the full focus of every team member on one thing only. Our Daily Scrum is scheduled for 9:30 am. We decided to do a morning session, starting right afterwards. However, we knew that it will take some time to bring everything to the meeting room and to set it up, so we could only start with everybody at around 10:00. Also, it was crucial to keep the session relatively short in order to end happily and go to lunch together. 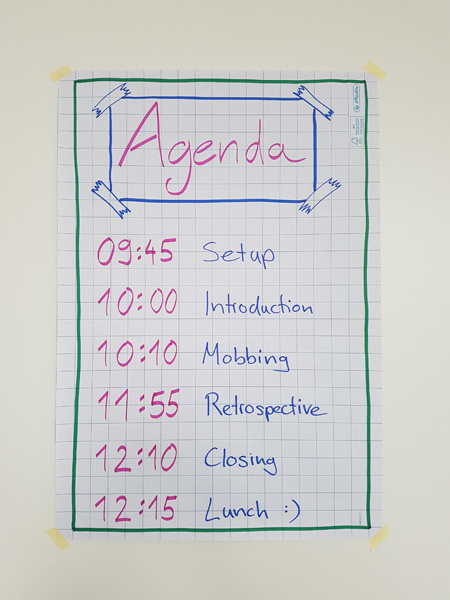 We scheduled a short introduction to mobbing to start our first session from a common ground. This was especially important as nobody on the team had experienced mobbing before. 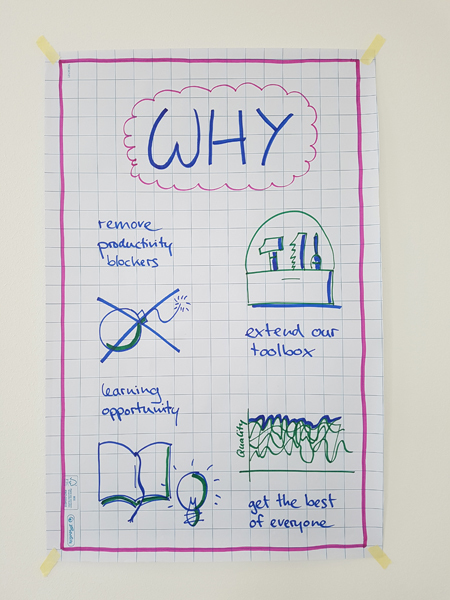 Following Simon Sinek's advice, we decided to start with "why". Extend our toolbox. To learn continuously, we should be open to new or different development approaches and know our options to chose from. We might not end up doing mobbing all the time, but it might be a great way to tackle huge, complex, unclear stories. Learning opportunities. Mobbing maximizes learning and sharing knowledge in the team, often including implicit knowledge. This way we can increase our bus factor even more. Besides that, you can always learn new things in a group, as everyone is used to different approaches, thinking styles, even keyboard shortcuts; so look out for the unexpected! Furthermore, teams who do mobbing say that it's like instant onboarding for new team members. As it happened, only two days ago a fresh new developer started in our team. Perfect timing to find out if mobbing as onboarding works for us. Get the best out of everyone. Last but not least, mobbing is actually not about getting the most out of the team and keeping everyone busy. We all have good days, but also bad days. When coding solo, the good and the bad both go into the code. But a mob will prevent the bad from being introduced into the code. Mobbing is about getting the highest possible quality out of the team. 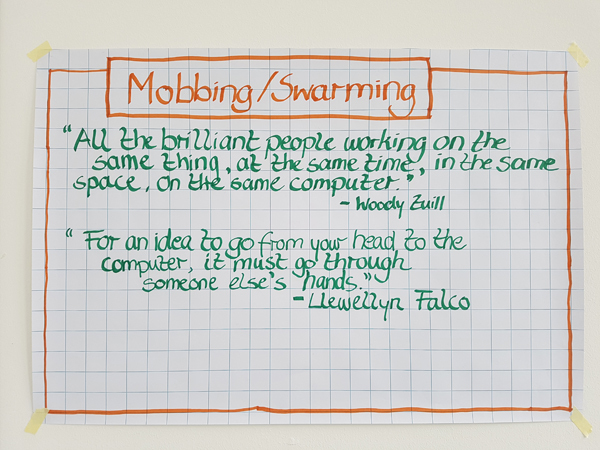 To explain the basic idea of mobbing, we used Woody Zuills famous quote: "All the brilliant people working on the same thing, at the same time, in the same space, on the same computer." As recommended, we decided to do strong-style mobbing for our first session, following the driver / navigator pattern. So we also introduced the key concept of strong-style pairing, as defined by Llewellyn Falco: "For an idea to go from your head to the computer, it must go through someone else's hands." 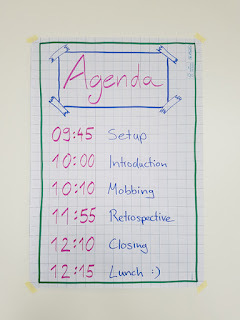 In order to explain the roles used in strong-style mobbing, we had put small cheats sheets right beside the location of the role (except for the facilitator). The driver. The one at the keyboard, acting as smart input device. There's no thinking at the keyboard, just do it! The navigator. This is the main programmer. State the intention, maybe add the location you're referring to, maybe you even have to go down to the keystroke required next; whatever is the appropriate level of abstraction for the current driver. The mob. The rest of the group. What do they do? Checking the navigator, contributing insights when appropriate, preparing for their own turn as navigator. The facilitator. Observing the group from behind the room, jumping in whenever required to ensure principles, roles and rules to create a safe experience. In our case, she also was queen of the timer. This role is helpful when you get started; it should not be required anymore later on. 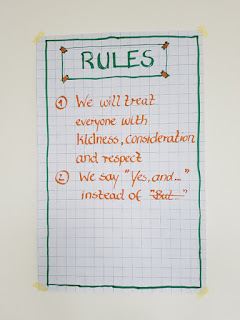 We defined the following common rules to make the session successful and valuable to everyone. We treat everyone with kindness, consideration and respect. Be kind. Listen to each other and consider all the options; everyone on the team should be heard. Let the others shine! And always assume that the person before you did the best they could with the knowledge at that time. The mob should be safe to experiment. It should be safe to learn. This experience can be scary at first, especially for those who normally don't code (like me) or are rather introverted (like me at most times). We say "yes, and...". This rule comes from improvisational theater and basically reminds us, instead of destroying what the one before us just implemented, continue with what we have and build upon it. 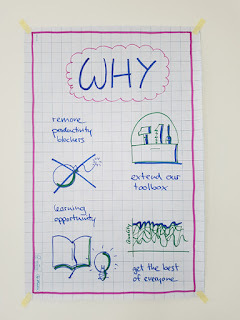 Providing examples on a whiteboard or flip chart can help as well. Or thinking in English, not in code. Going small steps, committing frequently. Do you see several solutions? Well, try both, the weirdest one, or the one from the most junior person in the room first. 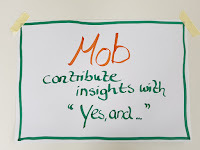 The mob format can work if you are either learning or contributing. To finally get us going, I concluded the introduction with a few more hints. We offered a flip chart if anyone wanted to foster shared understanding visually. We provided sticky notes and pens for whatever thought they wanted to note down, such as for their time as navigator or for the retrospective later on. The rotation: The navigator becomes the driver, the driver joins the mob, the next one from the mob becomes the navigator. We decided to rotate every four minutes as recommended for beginners. Later on this could be less strict, we could try different times, or rotate more fluently, whatever the team feels is right. We had predefined our very first rotation in advance. 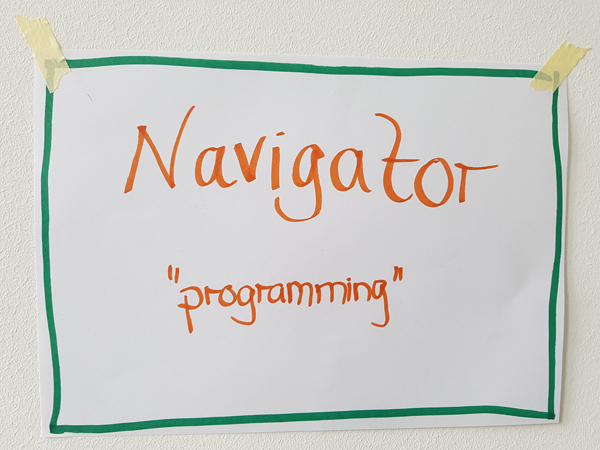 As we had our Product Owner on the mob who never coded before, myself having only basic programming skills, and a fresh new programmer on the team, we intermingled with the others to make sure that we didn't end up in a driver/navigator constellation where we instantly get stuck. 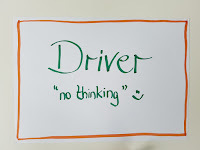 Furthermore, we defined two core developers starting as driver and navigator, which proved really helpful to kick everything off and get things started. 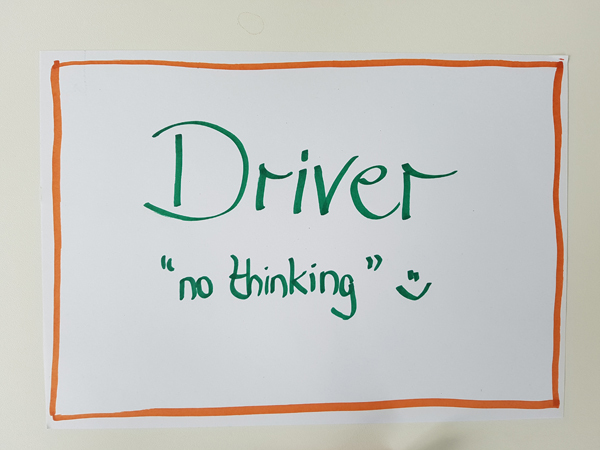 During the session, the hardest part was to keep the driver from thinking and rushing ahead without waiting for the navigator. In the beginning, the mob was quite unsure how to contribute, but soon learned to give advice when asked by the navigator, or even offer that voluntarily; but to always have the navigator decide which way to go instead of directly addressing the driver. 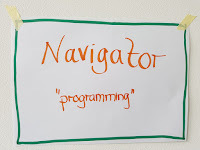 What instantly became clear: Even with a quite straightforward story, we struggled with being navigator. Several of us often required support from the mob; not only those who didn't identify as a programmer or were new to the team. And we struggled even more as driver, having different operating systems installed (OS X versus Linux), different keyboard layouts chosen (German versus English), different shortcuts defined, different scrolling directions set, and different input devices in place (external Apple touchpad versus Apple mouse versus default mouse). This turned out to be quite frustrating; at points, this made everyone look like it was their first day using a computer. We decided to have a short "What I loved" and "What I long for" styled retrospective, with everybody writing down their thoughts on sticky notes and presenting them afterwards to the rest of the team. Knowledge sharing. This feedback came from almost everybody on the team. We loved the sharing aspect in general; but especially learning more about a particular implementation, about how to solve common issues, and about different approaches to tackling a problem. Or simply how to start with a story regarding the thought processes involved. The most interesting finding here was that not everyone, I mean not every programmer on the team, shares the same knowledge of the existing source code. Learning why we do specific things. It was really helpful when the navigator explained why they wanted to do something, or what's the background of doing it like this (such as "leaving this parameter out will make it the default"). Interaction and collaborative mood. It was a really inclusive atmosphere! Our new team member loved getting advice from the more experienced ones. One of us even mentioned it felt like team building. Everyone can contribute. Our product owner said he was surprised that he could understand and contribute so much, although he never programmed before. He loved to see the code and its structure as well as to gain a better understanding of what the team does all day. Driver/navigator and mob roles. The strong-style navigation and mobbing itself was regarded as an interesting approach. Room setup. Our preparation proved valuable, the setup worked well for us! Finish a story as a mob. In our first session we could not complete the story we had chosen. Not even the implementation, let alone testing and all other activities included to get a story done. Which was a pity because we couldn't share knowledge about those parts of product development. So, we long for getting a story at least to the status that it's merged to the common code base. Try mobbing for a more complex story. The team selected a medium-sized straightforward story. However, our product owner is eager to try mobbing for more complex features. Probably to see if this approach would really help us to tackle those. Faster reload time of our web application. This is not directly related to mobbing, but it became pretty obvious that a simple page reload of our application costs a lot of time. As we decided on rotating every four minutes, we really felt the pain of having everybody waiting for the page to reload, shortening the time the navigator and driver had to proceed with the story a lot. No thinking, won't you? People felt it was really hard to break their habit of thinking and working on their own when sitting in front of a laptop. Less context switching. This point came up with regards to the frequent switch between the different roles; longing for a longer rotation duration. I totally agree with experimenting to find a rotation time suiting us. Still, this feedback took me by surprise at first, as personally my experience had been exactly the opposite. I'm used to switching contexts many times a day. Though I try to limit them wherever I can control it, many things can pull me out of my zone and flow. Therefore, mobbing was a total relief for me, enabling me to focus on one thing the whole time, staying in the same overall context. Productivity. No surprise, there are still a lot of doubts whether this approach is really productive as opposed to working solo. But we don't have any proof of that yet. In the end, I'm really glad my team agreed to another session. Can't wait for our next learnings! Besides that, I'm feeling a lot more prepared to facilitate mobbing sessions for other teams as well. 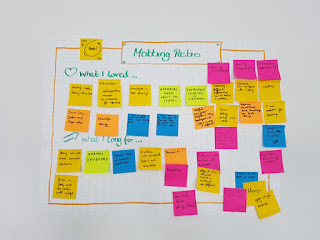 Some had heard we wanted to try this approach and showed interest themselves; one agile coach would even like to join our next session to watch and learn. Well, for now we only know the lessons of our very first session. But if you want to give it a try in your team, feel free to copy whatever you like and adjust it to what you need. I would love to hear about your learnings as well! Nice narrative, i'm greatful you're sharing your experience in such detail! I feel prepared to try that on my current project now, thinking of a mob test automation session to foster collaboration between iOS/Android test engineers and devs. I somehow missed one info, how many were you? Yes, you found the bug! :D Thanks a lot for your feedback. A mob to tackle test automation and share knowledge on that sounds just great. Let us know how that went! 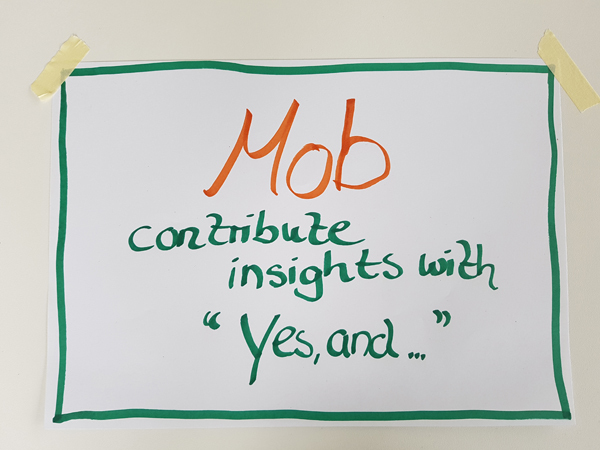 What I also didn't mention is that another team at my company also tried the mob format last week, on code reviews. I don't know the details yet, but it seems it helped a lot to find common ground and conventions in a team of very different personalities having strong opinions. In any case, it's definitely worth the experiment and the experience! Congratulations! I think, I'll try it too organize one, we already have regular dojos. One question. Did you follow TDD? Thank you! Would be great to hear how it went for you! No, unfortunately not. I would love my team to do TDD (and BDD) more, but they are still having the habit of writing automated tests / checks only afterwards. So as they surprisingly agreed to try the mob format, I decided to let them start as they are used to and not push them too much.